I took this photo at the farmer's market around the corner from my brother's house in Yangon, Myanmar. This particular seller's tray encapsulates the whole Thailand/Myanmar experience for me. There are some things here that I recognize: carrots, ginger, about 5 kinds of eggplant, sprouts. After that I'm lost. I don't know what the rest of it is. But it's ALL SO BEAUTIFUL AND I WANT TO TRY IT ALL!!!!! We started our visit with jetlag recovery in Rawai, Phuket, down in the south peninsula of Thailand. In Phuket, we happened upon our first instance of "I love this, what is it?" When we woke up, early in the morning (because jetlag), we saw that something was going to be happening in the park across from our hotel. From some of the early-arrival vendors, we thought it might have something to do with kids. Fortunately, it also had to do with food. Thai food. So delicious. This lady made the most amazing salad for us, and I got to practice the two words of Thai that I learned on the plane. The guy sitting next to me said I would need them: "my ped." Which means, "not spicy." I don't know if I said it correctly, but I was at least understandable because people would laugh and then only put one flaming-hot chili on top of the dish. There are no words to describe the deliciousness. As we tried to figure out what was going on (someone later told us it was Children's Day in Thailand), I realized how much I enjoy being in situations like this, where I don't know what's happening, and I just have to watch and follow along and explore and discover. After a couple of nights in Phuket, we felt reasonably human again, and flew on for an all-too-brief visit with my brother and sister-in-law in the neighboring country of Myanmar. I had no idea of what to expect from a country that was closed to the world for 60 years, and has only opened again quite recently. After we toured the immense and elaborate grounds of Shwedagon Pagoda, I said, "I'm ruined for pagodas. There can't be anything more amazing than this." Then the next day, we explored the city center of Yangon on foot with a wonderful professional guide who gave us the lowdown on local history and colonial-era architecture. At the end of the tour, we were able to enter the historic Secretariat, which was the center of government during colonial rule. The building is usally closed and impossible to visit, but a small part of the grounds and rooms were open for a show by artist Wolfgang Laib. I could never have predicted I'd see a modern art exhibition in a historic building in Yangon. Magical. The next day, we very sadly had to leave. I did not get to see enough of Myanmar, or my brother and his family. On the way to the airport, my brother took us to visit Yangon's reclining Buddha. And there we happened upon artisans at work, creating new stupas for the temple. The process was fascinating, the workmanship meticulously detailed. Seeing these artisans at work brought me to a new appreciation for all the incredibly elaborate decorative arts we saw in many other temples afterward. Next, we flew on to Chiang Mai for the business portion of the trip, where we spoke at a three-day conference. I gave three plenary sessions (with Andy's help), offered a workshop on filial play therapy, and did 3 or 4 individual consultations each day. It was a full work schedule, super rewarding, met so many wonderful people, loved it, awesome. And don't worry, we managed to find time for a fish spa. Yes, those are actual fish chewing on our feet. It felt like pins-and-needles. And yes, it was creepy, especially when they got between my toes. I don't know if you can tell from this photo, but they definitely had a preference for Andy's feet. I fell in love with all the details everywhere in Chiang Mai. Elephant bridges, monk lineups, dragon stairs, temple bells, ancient monuments. In Chiang Mai, we also happened upon a commemorative ceremony for the recently-deceased King of Thailand. When we stopped to see what was happening, we were given candles and urged to stay. After the conference, we made time for a drive into the countryside for a climb up the "sticky waterwalls," so named because they are made of limestone so you can stick to the rocks and climb right up. And even take bad selfies in the middle of the climb. And then a funny thing happened on the way to the airport... we missed our flight! NEVER has this happened to us in all our years of travel. The ticket said 1:35, and we thought it meant 1:35 in the afternoon. Not so. It meant that other 1:35. At which point we were asleep in our bed. Sooooooooo... we got an extra day in Bangkok while we awaited another flight, and then, like the wise men, we came home another way. It turned into an around-the-world trip! 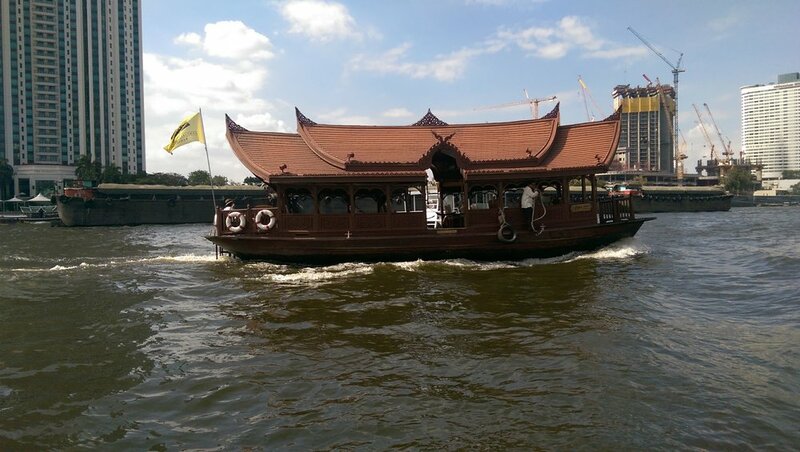 With our extra 6 hours in Bangkok, we took the train downtown, got on the tourist river boat, and enjoyed a few more sights than we'd expected. It's a beautiful world, my friends. Full of wonderful, warm, welcoming people.